RSC artistic director, Gregory Doran, reflects on the life of John Barton, who died last Thursday. It was with great sadness that I had to report the death of John Barton. John was both a great director and teacher, and simply one of the greatest influences in the acting of Shakespeare of the last century. John was invited by Peter Hall to co-found the Royal Shakespeare Company in 1960, and worked with the company for the rest of his life. In 1963, he collaborated with Peter on the ground-breaking The Wars of the Roses, which defined the principles and direction of the new company. A number of productions of the plays in the canon, which John directed in his own right, are still regarded by many as close to definitive: Twelfth Night at Stratford in 1969, with Judi Dench as Viola, and Donald Sinden as Malvolio; and in 1976 a Much Ado About Nothing set in the Raj with the same pair of actors as Benedick and Beatrice, and John Woodvine as a very funny Dogberry; Love’s Labour’s Lost in 1978 with Michael Pennington as Berowne and Jane Lapotaire as Rosaline; or The Merchant of Venice, first with Patrick Stewart as Shylock at The Other Place, and then David Suchet in the Royal Shakespeare Theatre in 1981. But perhaps John’s greatest influence on the company, and hence to the profession, was his passion for the verse, and his ability to uncover the clues that Shakespeare wrote into the text to enable actors to deliver it with freshness and vivid clarity. In one such workshop, with a group who had little experience of Shakespeare, as John gently encouraged and inspired the actors, they steadily grew in confidence, and excitement. I remember thinking “this man’s brain is a modem connected to the Shakespeare Internet. He is an access provider and the company are busy downloading”. I helped John compile a list of the things that the actors had found most useful from the session. Not a definitive list, and subjective to that group’s experience, but it included some basic priorities, which might sound deceptively simple: ‘tell the story’, ‘play the argument’, ‘ask the question’, ‘aim for the full stop’, ‘fresh mint the images’, ‘own the words’, as well as more detailed attention to ‘respect the monosyllables’ and ‘go for the antithesis’. And John insisted that our list was not about ‘how to speak the verse’, but as he titles it ‘how to make an audience listen’. 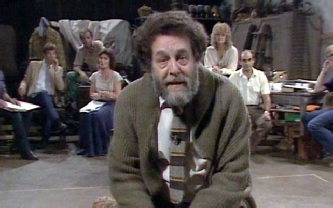 As well as Shakespeare, john directed some other major classics: Ibsen’s The Pillars of the Community with Dench and McKellen at the Aldwych in 1977; Congreve’s The Way of the World with Beryl Reid as Lady Wishfort at the Aldwych in 1978; Chekhov’s The Three Sisters at the Barbican in 1988, with Harriet Walter as Masha, and Brian Cox as Vershinin; Ibsen’s Peer Gynt with Alex Jennings in 1994; Harley Granville Barker's Waste, again with Judi Dench, at the Pit and then at the Lyric Hammersmith in 1995. Then there were discovery plays: Alpha Behn’s The Rover in the opening season of The Swan (1986) with Jeremy Irons and Sinéad Cusack; Calderon’s Life’s a Dream at The Other Place; Byron’s Cain in the Pit in 1995. John devised his own anthology programme about the British monarchy, The Hollow Crown in 1961. It continued to be revived and toured as recently as 2005, when Derek Jacobi, Diana Rigg and Vanessa Redgrave took part in a tour to Australia and Canada. In fact Ian Richardson once said that every member of the Royal Shakespeare Company ‘present, passed or passed-on’ had participated in it at one time or another. My own first experience of John’s work was his extraordinary production of Richard II, in 1973, in which Ian Richardson and Richard Pasco alternated as Richard and Bolinbroke. And a decade later the spell-binding ten play cycle The Greeks, derived from Homer, Euripides, Aesychlus and Sophocles, which told the entire story of the Trojan War with a freshness that was both direct and vivid. I shall long remember Janet Suzman as the sisters Clytemnestra and Helen of Troy; or Billie Whitelaw as Andromache stumbling out of her shoes, pole-axed by grief at the death of her son, Astyanax. Or Orestes and Electra, reminding us of Baader-Meinhof terrorists, seeking revenge for the murder of their father. His obsession with the Greeks stayed with John all his life, and he returned to them again in 2000, in Tantalus, a new version of the entire story of the Trojan War, including the wooden horse this time, in his own words, a co-production between the RSC and the Denver Center in Colorado, directed by Peter Hall and his son, Edward, and a company including Greg Hicks, Alan Dobie, David Ryall and Ann Mitchell. John continued to work with the company, until a couple of years ago. Indeed, when I directed Malory’s Morte d’Arthur (long one of John’s passions) we held sessions together in which he delivered whole sections of the book from memory, including, most wonderfully, the list of a hundred knights. He continued to conduct sonnet classes, old master classes and one-to-one sessions in his New Cavendish Street flat, intriguing young actors, by his constant chewing of odd yellowy green nicotine (it used to be razor blades apparently), and getting tangled in his big woolly cardigans. Although frail in body at the last, he was always mentally alert and retained his sense of curiosity until the end. He had only just moved from New Cavendish Street to a care home in West London. He was in his 90th year. The programmes were also issued by Acorn Media UK on DVD.